Both Bible history and the archaeological discovries make it very plain that the walls of Jericho fell down. 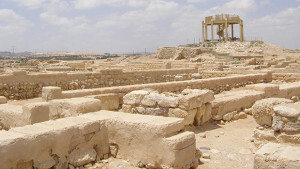 Recent excavations at Tell es Sultan, the Arabic name for Jericho, provide futher evidence for that. The problem is that authorities cannot agree on whether the Bible and archaeology are referring to the same walls. Led by Moses, the Israelites wandered in the wilderness for 40 years. Under Moses' successor, Joshua, they crossed the Jordan River. 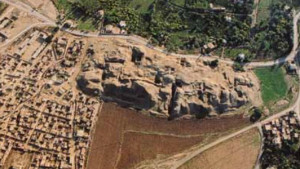 Jericho was the scene of the first confrontation on the west bank of the Jordan River betweent the Canaanite inhabitants of the land and the Israelites. The Israelites were commanded to circle the city once each day for six days, and then seven times on the seventh day. Joshua 6:20 relates, "So the people shouted when the priests blew the trumpets, and it happened when the people heard the sound of the trumpet, and the people shouted with a great shout, that the wall fell down flat. Then the people went up into the city, every man straight before him, and they took the city." This record does not imply that it was the noise of the trumpets or the shout of the people which caused the walls to topple. It is most likely that an earthquake occurred at this moment which brought down the walls. John Garstang unearthed the fallen walls and the recent excavations also found similar evidence. Shimon Riklin was in charge of some development work on the tell in December 1992 and at the same time did some digging. Writing in ESI 15 he reported: "A 7.25 m long stretch of a massive brick wall (W100; width 2.3 m), ending in a heap of fallen stones, was exposed c. 1.75m east of the city wall and parallet to it. The six surviving courses of this wall (heigh 0.75m) were built of brown and white bricks joined with cementing material. The courses are somewhat irregular, possibly due to an earth tremor" (page 69). The latest excavations at Jericho support this conclusion. "A 19m long north-south strip of Early Bronze Age CIty Wall H was exposed in the excavations of the tell strata. The city wall...was built of brown bricks laid on two stone courses. THe bottom part of the eat face of th city wall was built of narrower bricks. The desctrion of the upper part of the wall can be distinguished in the south section of the excavation area." (ESI 15 page 69). With these latest identifications we are in agreement. It was undoubtedly the Early Bronze (EB) walls that collapsed, but with their dating we would disagree. The EB Period is usually considered to have ended about 2000 BC. 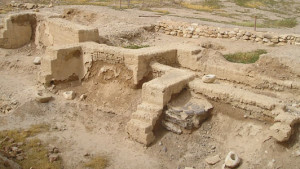 We would agree with Dr Courville that the EB Period ended about 1400 BC which was when the Israelites conquered Jericho. That would be when "the wall fell down flat." Rather interesting is Riklin's observation that "further north, there is a breach in the city wall, in which the imprint of a human foot was visible" (page 69). Could this be the / earliest Israelite footprint ever jiscovered? If Courville's conclusions xe correct, perhaps the imprint is of me of the soldiers who "went straight I before him" to enter the city and I destroy its impious inhabitants.